With a very special flower shape, the flowers have a fringed edge, changing from orange to yellow. Petals curl in all directions and this gives a special effect. The bright display and fringed edges look stunning when the flowers fully open. 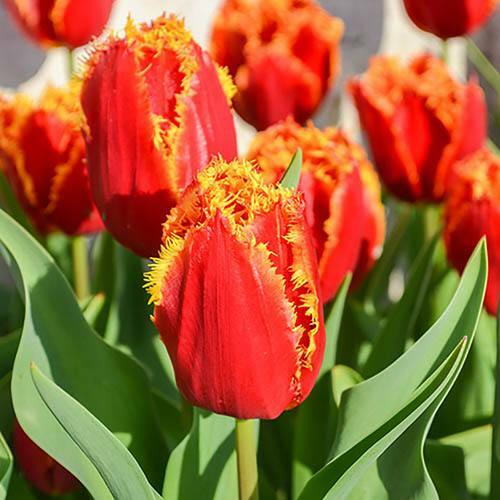 Tulip 'Lambada' creates a dazzling display with it's fiery colour scheme and frilly petal edges. As the flowers change from red to orange and finally to yellow as you near the top of the flower head, the vibrant display is topped-off with a frilly finale which looks spectacular once the flowers are fully open in April. Plus, like other fringed tulips, such as 'Canasta', they'e one of the longest lasting of all the tulips. Their short and compact large orange flowers will thrive in borders and pots and will also look stunning when cut and brought indoors to create beautiful vase displays. They're incredibly weather resistant for such a delicate looking flower and they're not only easy to grow, so they're great for beginners, but they're easy to look after too - maximum impact for minimum effort. Supplied as a pack of size 11/12 bulbs, ready for planting.